The Journey to where we are today began for me back in August of 1992. My brother Stu had seen a friend's paraplane, and wanted to fly it. He was told that he would need to go through the training course before he could fly it, and the closest training to us was located just north of Santa Barbara, at Santa Ynez airport. Stu told me about his flight in this funny looking contraption, and I thought that if my younger brother could do it, so could I.
I took vacation & we both went up there, me for my 1st flight, & Stu, to fly again. I was told that the flight would be solo, and I questioned this. Stu told me that it was easy & that I would have a blast. I said OK.
We got to the airport in the morning, and since this was to be my 1st flight, I was told that I would need to watch a video, read a short flight manual, fill out some paperwork & take a short test. Test I said?? (I hate tests) Well, I read the flight manual and watched the video, showing how the paraplane flew. Looked cool to me. Then, the 2nd part of the video came on. First thing I heard was reveille, like they blew when I was in the army to wake you up before anyone has any business being up. Then I watched Mr. Lawyer, who went thru the next section of the paperwork, a paragraph at a time, having you initial each paragraph as you went thru it. This was the waiver. It sure got your attention, made me think, what has my little brother gotten me into now. I signed it, took the test, and then took the papers to the instructor, John Hall of Coastal Flight, Inc. When he was done with the student he was working with, he reviewed it to make sure I had crossed all my T's & dotted the I's. We then went to the Paraplane, where I looked it over carefully, although I had no clue what I was looking for at the time. Stu was there with me, & assured me that everything was in order, so I followed John Hall's instructions, and sat in the seat. I was then given a very through pre-flight briefing, (which, with a few changes & updates, we still do today). Then I put on the communications helmet, strapped in & John gave each engine's pull starts a few pulls, & both engines came to life. They were twin 15 HP solo engines, which sounded very different from the powerful engines we use today. (they sounded like bigger than normal lawn mower engines) John made sure I could hear him, I waived that I could, since it was only one way. He talks, I listen. One of the nice parts of this is the area we were flying in, beautiful country, with lots of wine growing going on. I mention this in order to point out that during the briefing, the instructor pointed to the fence at the end of the field, and specifically to the plants on the other side of it. He then told me that it was very important that I do not land in or on any of those plants, or end up in them in anyway whatsoever. When I asked him why, besides the obvious that I would be entangled in the grape vines was what it would cost me. Each plant that I damage, if I land in them, would cost me $1400.00 each. Needless to say, when I came in on final to land, I gave that area a wide berth. Now I was ready to takeoff. I got the command to power up, which resulted in the wing kiting overhead, building the wing. And when the instructor thought the wing was right, he had me go to full power, at which point I left the ground. As I lifted off, I said to myself, what am I doing?? I remembered my pre-flight briefing, word for word, and particularly the part about committing to the flight as I was taking off, so I made sure I stayed at full power. I made a left turn as I was told so I would be out of the way of other aircraft & glider operations that we shared the airport with, and climbed to 500 feet altitude. I orbited on that side of the airport until the instructor told me over the radio to cross the main runway where he had previously told me, and to go fly over the field for a while, turning, climbing, descending, and generally have fun. It was the best, an E ticket ride. I remember seeing several CHP's in Mustang's pull people over on the Solvang highway, and hand out tickets. They were open for business that day. I was wondering what they were thinking when they looked up & saw me flying high above them. After some time, though it seemed too short a time, I got a call from John to start back to the airport, cross back where I had crossed on the outbound flight & prepare to land. As I came in, I made sure not to fly over those very expensive grape vines, and made a smooth landing, though a bit long. After I got the engine shut down & the wing collapsed, I unbuckled the 4-point safety harness, & was waiting when John Hall got there. He asked why I landed so far down the runway, & I reminded him about those expensive grape vines, & that if things went bad, I did not want to end up on the wrong side of the fence. I was hooked. After the other students were done flying, I bought some more time. I went back a few weeks later for some more time & Stu & I decided to go in together & bought a used Paraplane. We shared it, both getting in flight time. We started talking about becoming dealers for Paraplane. I called John Hall and asked him what was involved & how to get it started. I got in contact with the Paraplane Corporation, had the paperwork sent out, with all the dealer requirements & costs. Stu & I discussed it at great lengths, we found out when the next dealer training class would be, as we both wanted to go. I took the time off from my job, and off we went to New Jersey to learn about being a paraplane dealer, & get trained to become instructors. It was in March of 1993, and it was still cold there. This is where we met & were trained by Steve Snyder himself, the inventor of the Paraplane, the 1st commercially made powered parachute. While he did not give us our 1st flight training, he was instrumental in our growth to become safe & competent instructors. I like to think that training with Steve Snyder in powered parachutes would be like early aviation pioneers getting to train with Orville & Wilbur Wright. While there, we got to see his operational F-86 Sabre jet, parked on the tarmac, and in one of the hangers where some of our training was conducted, 2 Messerschmitt ME-262 WWII jets that he was restoring. This is also where we first met a new employee of the Paraplane Corporation, Matt Dautle, an aeronautical engineer, who would a few years later, after Paraplane would go out of business, start his own powered parachute company. Well, we survived dealer training, returned home and started to fly & attract students, and sell some planes. In July of 1993, all the dealers were informed that Steve Snyder had sold Paraplane to his dealer from Japan, Yo Fujioka, and it became Paraplane International. Things went on pretty much as before, with plans announced that they were going to begin development of a 2-place plane. This took about 3 years before the production model was ready, the Golden Eagle II. We were the 1st dealer to sell one, the order was booked about 6 months before delivery. When it was finally ready, the plane was shipped to us, fully assembled. Yo & Matt Dautle, the designer of the Golden Eagle II came out to the high desert of California to see to our training on the new plane. We finally got some good weather & received our training, in February of 1997. By the end of 1997, Paraplane International closed, due to some personal issues in the owner's family in Japan. Yo returned to Japan to take care of the problems. A few months later, Matt Dautle had acquired the ownership rights to the design of the Golden Eagle-II and started his own company, Paladin Industries. We were offered and accepted the distributorship for the west coast. In 1998, Stu & I, equal shareholders in Inland Paraflite, mutually decided that the company should be owned by one of us, and we agreed that I would take over the entire company & that Stu would stay on as an instructor. We continued with Paladin & Matt until he closed the company in the fall of 2001, selling off the design of the Golden Eagle to another company, and his new single seat to still another company, with which he accepted a position as their aeronautical engineer. During this time, Inland Paraflite, while not selling for any manufacturer, continued to fly & train students. I looked at many companies, looking at the planes they offered, and their stability & backing. After all, the last 2 manufacturers we were dealers for went out of business, & I did not want to repeat that again. I had narrowed it down to a few companies, based on the quality of their planes, how they flew, then looked at how stable they were, talking to other dealers to see how they were treated, & how the customer support was. I also talked to a few vendors about how the various manufacturers paid their bills to the vendors. One company consistently stood out heads above the rest I was asking about. I then made arrangements to fly one of their planes, since I would not take on a plane without first flying it & giving it close scrutiny. 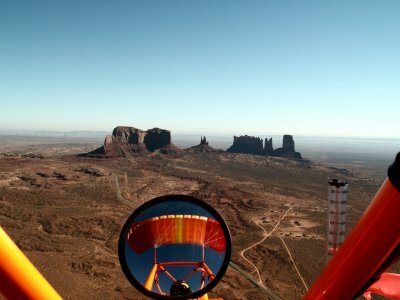 It was July of 2002, and Fredrick Scheffel of Sky Trails Ranch in St. George, Utah, invited me up to fly the newest offering from Powrachute, the Pegasus. One flight was all it took. This was the most stable, easy & forgiving powered parachute I had ever flown. It handled crosswinds with ease, as demonstrated by Fredrick when he took it up 1st for a test flight to show me how it flew. He took off with a 90 degree cross wind, which surprised me, however, as I watched him kite the wing, all I saw was the wing weathervane into the wind a bit, and Fredrick took off effortlessly. When he landed, I commented about the crosswind takeoff, asking him why he did that and remember his response vividly to this day "I didn't feel like pushing it out to the middle of the field to get into the wind." That blew me away, but after what I saw, I was ready to fly the Pegasus. I had wanted Stu to come with me as well to help evaluate it, but he could not make it. I was so impressed with the Pegasus, that I started the process to become a dealer for them, and in Sept. of 2002, placed my order for the Pegasus. It arrived in early October. I got it assembled just in time to go to the annual Color Country Chute In held in St. George Utah by Sky Trails Ranch. I did the break in there, got the chute rigged, and did the test flight. It flew well. When I returned home, Stu finally got to fly the Pegasus, and he was impressed with it as I was. He said I made a great choice. We started to do dual flights with it, and soon were doing our solo flight training in it as well. We found the Pegasus to be more stable, easier to handle, especially for 1st time students, than the plane we had trained with since 1994, the Paraplane PSE-2 Osprey. While the Paraplane is a great flying plane, lots of fun and easy to fly, the Pegasus just made our training much easier for us as instructors. I have been exclusively training in the Pegasus now, and have been busier than ever. Inland Paraflite, Inc. is the only full time powered parachute training center in California, offering introductory flights, first solo flights, and for those who want to truly master the art of flying powered parachutes and own their own plane, our Sport Pilot training course. This brings us to fall of 2005, and Sport Pilot. As of this writing I have passed my FAA written knowledge test for CFI, (certified flight instructor) for the sport pilot rating for powered parachutes, and I have now taken my check flights in Greenville, IL with Roy Beisswenger of Easy Flight, Inc., one of 3 Sport Flight Instructor Examiners certified to endorse sport pilot CFI's. I passed my oral examinations as well as the flight test, and now have my Sport Pilot rating for powered parachutes and my CFI rating, which will allow me to train new sport pilots under the new rule. On November 8th, 2005, I met with DAR (Designated Airworthiness Inspector) John Shablow, who did the required airworthiness inspection on my Powrachute Pegasus, and upon passing, he issued my airworthiness certificate and operating limits, which are required to be carried on the plane at all times during all flights. Prior to this I had applied to the FAA in Oklahoma City for my registration number, commonly referred to as an N number, or tail number, which I had received prior to meeting with John Shablow. As we continue forward I have been invited to attend the FAA's Designated Pilot Examiner week long training at FAA headquarters in Oklahoma City, OK. I have spent the 2 weeks preparing for this and major stressing, hoping I will be ready. About a week prior to going in June of 2006 I was privileged to be able to spend the day with Jon Thornburgh, who is himself a DPE and an SFIE, (Sport Flight Instructor Examiner) for every light sport category except powered parachutes. We will solve that one day soon. Jon is also a GA CFI, retired airline Captain and Navy Jet driver. We went over what I would be doing at the examiner class as well as much of the aeronautical material that we use daily in our flight training. I learned a great deal from Jon and once I was back there found that I was well prepared for the class. Normally we would have done our check rides while there, but due to bad weather we were unable to complete that, and were told that an inspector would schedule a visit with us at our home base to complete the process and make us all newly minted DPE's. In July Jim Lamb arrived here and we did the final flying check ride, with Jim acting as the new sport pilot applicant and myself acting as the examiner doing the check ride. Jim would intentionally mess up to see how I handled it, (would I fail him?) and when he did, I advised him of the unsatisfactory performance. I passed and received my DPE credentials. Each year all the DPE's get to do a renewal check ride with an FAA inspector from the light sport branch, and in May of 2007 Jay Tevis arrived to do my renewal and add on the SFIE rating. I had my plan of action all prepared and took Jay through the check ride, and like before with Jim, Jay would intentionally perform a task incorrectly to see how I handled it. Well, I must have done OK because I got my SFIE designation and could now do practical tests for both sport pilot and CFI applicants. We're now into 2009 and I will soon be seeing Jay to do my examiner validation check ride flight, though now we renew our designation every 2 years, but still get to do a check ride with an FAA examiner every year. Actually I find it to be a great learning experience and fun, and I have found everyone at the light sport branch to be very helpful, making our job in the field a lot easier. Well, that brings you to where we are on the Journey, the rest is history, and as we at Inland Paraflite say: "It's FLYING PURE AND SIMPLE!" I would like to say here that one of the best things about owning and flying a powered parachute is the ability to travel to many different places and be able to fly, and over the many years I have been flying powered parachutes, I have gotten to fly at many different locations. I have trailered from Apple Valley, California to the EAA Arlington air show in Washington State, the longest trips I have made, and flown there 3 different years. That was beautiful country to fly over. On one of the drives to Arlington, I stopped over in Fresno, California and took a potential new student for an introductory flight lesson at an airpark on Herndon Ave. I also did some training of one customer who lived in Washington at the field Clyde Poser has at his home in Washington. So nice to be able to push out of your own hangar & fly without trailering to the field. I have also flown at several of the Veterans Day air shows held at Flabob Airport in Riverside, CA. That was a nice airport to fly from. In 1997 and again in 1999, I have flown at the EAA Copperstate air show held in the Mesa Arizona area, at Gateway/Williams airport. I have also attended and flown at the Salton Sea fly in several years, as well as other locations in the Palm Springs/Indio California area, including Thermal-Cochran regional airport. I have never seen so many golf courses in my life as I did flying that day. Let's not forget the many Color Country Chute festivals I attended in Hurricane, Utah. I have also flown several different times at the El Dorado dry lake bed in Las Vegas, and recently at Jean, Nevada airport. I have also flown at Camarillo airport, with some nice scenic flights over the Ventura Pacific Ocean coastline with Evan Green in his powered parachute, as well as several different flights from his private field at his lake house in Arvin, just south of Bakersfield, California. One of the most exciting and fun flights was in August of 2006. After a change in operating limits permitted it, I was able to fly my Powrachute Pegasus powered parachute at Torrance airport, about 6 air miles from LAX. What an experience that was, flying in the pattern over Crenshaw Blvd. and Pacific Coast Highway, under full air traffic control tower control. I also had Jon Thornburgh with me for an extra pair of eyes and ears. I look forward to repeating that experience. Please feel free to Contact Us or call us directly at 760-242-3359 to start your journey to be one with the sky! (c) Copyright 1996-2014 Inland Paraflite, Inc. All rights reserved.